The World Cup is kicking off, and football fever strikes across the globe. Here in the UK, big challenges need big powered access machines – and in a certain corner of north London, there is no bigger development right now than the new Tottenham Hotspur Stadium. In autumn 2018, 62,062 football fans will have JMS ultra boom technology to thank, in part, for the chance to watch football in the UK’s latest super stadium, complete with a grass pitch on a tray. JMS is supplying a range of powered access machines to support contractors working hard to complete the stadium and associated development sites at a cost of £850m. They include three World Class booms from JMS’s large boom hire fleet, which are playing a vital role to fit out the stadium, including installing 324 floodlights on the underside of the roof. JMS Managing Director Mark Jackson said: “The contractors are working to exceptionally tight timescales, so need the very best, most effective, and safest powered access machines while working at height. The spine of the JMS access hire fleet at what is called the Northumberland Development Project is made up of three powerful ‘premier league’ booms. Up front, in the Harry Kane role perhaps, is the JLG 1850SJ boom, which has an exceptionally fast elevation speed for such a large boom. Its platform can rise to a maximum working height of 58.57 metres and has a maximum outreach of 24.38 metres. 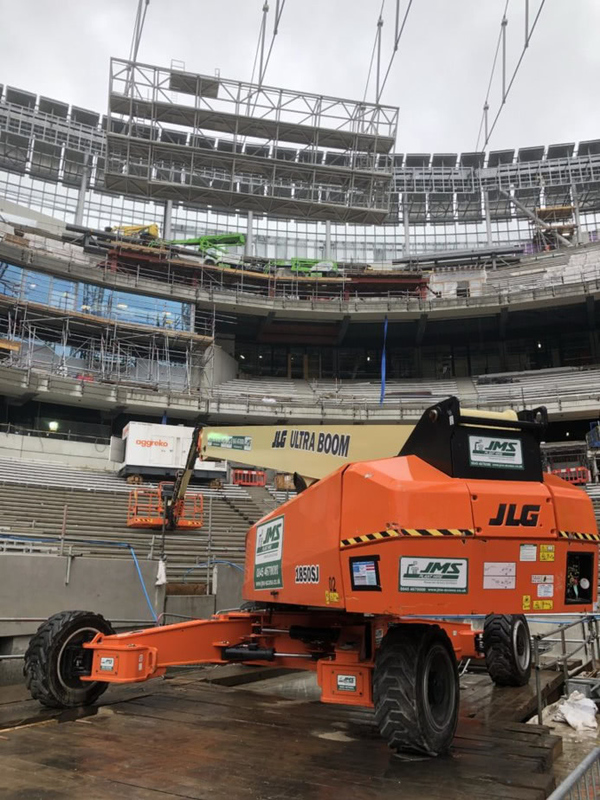 JMS supplied the JLG 1850SJ Boom to customers building the new Tottenham Hotspurs stadium. Just behind that machine, it is the Dele Ali of boom lifts, the Genie (perfectly named) SX 180, the highest reaching self-propelled boom in the Genie Super Boom range. It has a maximum working height of 56.86m, a maximum outreach of 24.38m it offers an extreme working envelope, and a self-levelling platform on the end of a rotating jib allowing it to swivel (like Mr Ali) and position operatives precisely where they need to be. Finally, holding the fort in the backline is the JLG 1500 AJP – not unlike Eric Dier – the world’s tallest articulating boom, which the widest working range of any machine of its kind. With a maximum working height of 48.15m, and an up and over height of 18.40 metres, this boom is as versatile as they come, anywhere across the worksite. 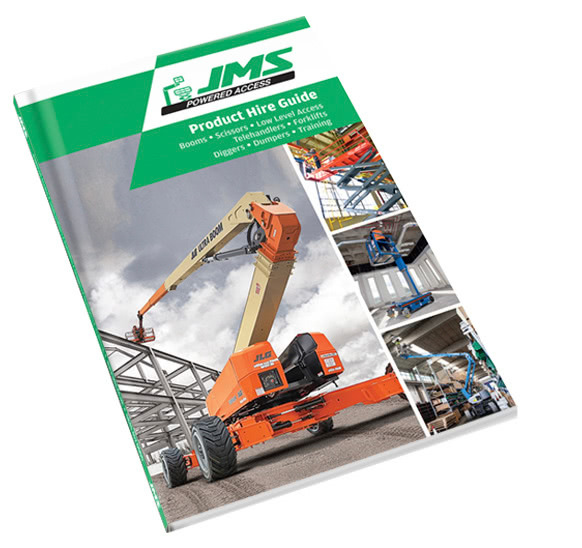 With JLG QuickStickTMcapability, it can get from full height to ground in just two minutes. JMS is also providing a range of smaller access machines, including highly flexible Ecolift and Pecolift personnel masts for low-level safe working at height. The machines are ideal for tasks that include electrical wiring, ducting installation, and pipe fitting. All powered access equipment is available for hire nationally through JMS’s depots in Harpenden, Hertfordshire, Leeds, West Yorkshire, Pinewood studios and Radlett.